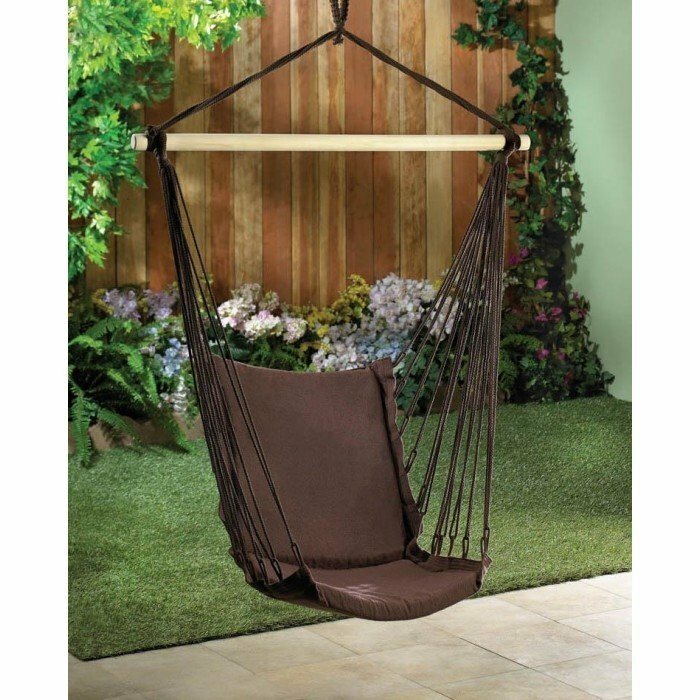 ESPRESSO COTTON PADDED SWING CHAIR home decor, jewelry, decor, decorations, electronics, fountains, floor mats, art glass, vases, garden essentials, fireplace screens. This will be your favorite seat, indoors or out! Espresso-colored cushions held by matching rope and a wooden frame, all designed to give you a premium outdoor seat for relaxing as you sway with the summer breeze. Max weight limit. : 200 lbs. Material(s): WOOD - SCHIMA METAL COTTON - RECYCLED. Weight: 3.2 pounds. Dimensions: 39.5" x 32" x 55".